You can never keep a good man down, so it would seem. Nick Rutta, who has been serving up food with a African and Caribbean twist in Peterborough for more than a decade was devastated when he was forced to close EMBE on Burghley Road last summer. 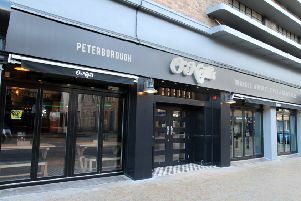 It was a restaurant he had built up over the last five years at the former Glass Onion pub, having previously operated out of the City Club basement in the city centre and the Thorpe Lodge hotel on Thorpe Road. But dwindling numbers, which he partly blamed on the draw of the chain restaurants in the city centre, saw him close the doors in July. Since then he has operated as a pop-up in Cambridge and at the weekend popped up at Peterborough Market where he outlined his plans for a return to the city, with a crowdfunding venture. “Over the last 15 years I have developed and realised I am passionate about food, people, service and business. “I believe I can still develop and create a product and brand that is popular and loved by you, as you may have already seen with the last EMBE. “The market is huge for the Afro-Caribbean cuisine as we can see from the growth of the ‘Turtle Bay’ brand. “2016 is set to be the year of hard work in order to re-open EMBE Restaurant. The future of EMBE is huge, with a bit of support and hard work, the cook book will be written, the sauces will be developed, the cookery classes will be established. Nick is looking to raise £45,000 through GoFundMe . Anyone pledging will be given special reservation rights, plus depending on the amount, various rewards and discounts.